I dont know about anyone else but I am fed up with all the wires, adapters and plugs that come with all our beloved gadgets, there is nothing worse than trying to get a charger out of a ball of wires, especially when you know that you had put them into the draw all separately and neatly, but like some sort living organism when you need to charge up a certain device they have by some magic, twisted and rolled into one mass. Now Callpod have developed a new charging system called Chargepod. Chargepod is a six point charging device, it will allow the user to charge up to six devices all in one hit, no messy wires or extension leads, a none of the spaghetti to fight through just to get the right charger out. What you get a central charging hub, the Chargepod, which comes with many versions of power adapters, these are controlled by a system called voltage regulator technology, which will make sure that each device that is connected to it will only get the right amount of power, this is essential for the long life of the device. Where the wire is connected to the Chargepod there is a cool blue indicator light, which shows what device is on charge. 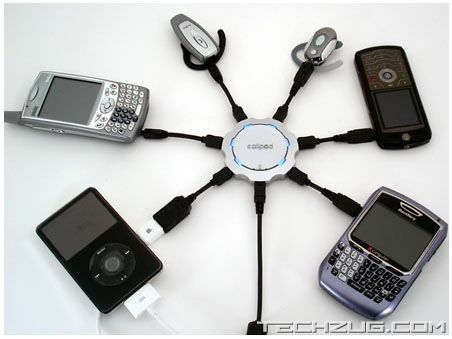 As the picture shows it is possible to charge a variety of devices all at one time, whether this is a good idea or not, is yet to be proved, having all six devices connected to just one charger, must generate a lot of heat, but you do have the added bonus of only having one plug to put into the socket, so it looks good.